Where do Wieringers work in 2015? New informationtechnology has made it possible for larger groups of people to do their work for the most part at home. Because the economy has become virtual for a considerable part, the physical location of a company is not that important any more. What does count is a good connection to the electronic superhighway. Because of the increased bandwidth, improved data transfer protocols and the simplified access to all electronic services, it is now (at last) possible to speak and meet as if sitting face to face. 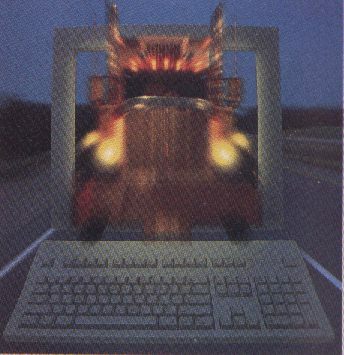 A disadvantage of the virtual economy is that it puts heavy demands on logistics. Many companies save time and money by bypassing a dealer-network, but the price to pay is figuring out an efficient way of getting the endproduct directly from the factory to the customer. At this moment hard work is being done to build a nation-wide system of "tubepost" which will ultimately replace present lorry-transport. Below ground tunnels are bored with a 2 metres diameter. Special containers are pushed through these (near vacuum) tunnels with high velocity from distribution point to distribution point. Hippolytushoef will also get a distribution centre where goods are packed in containers for shipment through the tunnel. On the receiving end the goods are distributed out of the containers into hybrid (diesel-electrically driven) vans. The system is designed so that the distance between distribution centre and receiver is 25 km maximum. All the above named developments have led to an increasing number of Wieringers working from home. Besides that, numerous small companies have been started which work on internet- and software services. They profit from the low costs and taxes on Wieringen and also create new jobs on Wieringen. Existing industry is stimulated to economize the use of energy, raw material and environment by all sorts of subsidies and taxreductions.